Cacao, or the cocoa plant, is a small, tropical New World, evergreen tree, Theobroma cacao, that is widely cultivated for its seeds, which are used to make chocolate, cocoa butter, and cocoa powder. Cacao is characterized by large, unlobed, alternate leaves, small pinkish flowers produced in clusters directly on the trunk and branches, and leathery, ovoid fruits, or pods, in which are embedded numerous almond-shaped seeds, which also are known as beans, cacao beans, or cocoa beans. The chocolate residue found in an ancient Maya pot suggests that Maya were drinking chocolate 2,600 years ago, the earliest record of cacao use. Chocolate was an important luxury good throughout pre-Columbian Mesoamerica, and cocoa beans were often used as currency. The Aztecs associated chocolate with Xochiquetzal, the goddess of fertility. Cacao reflects on the principle of bi-level functionality, whereby the seeds of the cacao serve the individual function of reproduction for the plant, while also advancing a larger function for human beings in providing a desirable food. In the case of the cacao, the seeds offer a thousand flavor components and hundreds of chemicals that affect mood, soothe the mind, provide nutrition, and stimulate the taste buds. The plants also offer ecological functions in providing food for various animals, including insects. In addition, the ability to grow these plants under shade conditions allows a less intensive form of agriculture whereby a canopy of other trees is maintained, allowing preservation of biodiversity. Cacao, or the cocoa plant, Theobroma cacao, is a member of the Sterculiaceae (alternatively Malvaceae) family of flowering plants. It is one of 22 known species in the Theobroma genus. 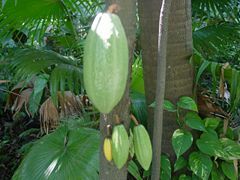 T. cacao is a small plant that grows to about 4 to 8 meters in height (15 to 26 feet). The leathery leaves are alternate, entire, oblong, unlobed, 10 to 40 centimeters (4 to 16 inches) long and 5 to 20 centimeters (2 to 8 inches) broad. 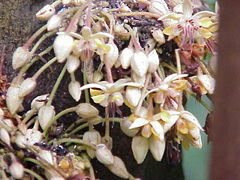 The flowers are produced in clusters directly on the trunk and older branches. They are small, 1 to 2 centimeters (1/2 to 1 inches) diameter, with pink calyx. While many of the world's flowers are pollinated by bees (Hymenoptera) or butterflies/moths (Lepidoptera), cacao flowers are pollinated by tiny flies, midges in the order Diptera. The fruit, called a cacao pod, is ovoid, 15 to 30 centimeters (6 to 12 inches) long, and 8 to 10 centimeters (3 to 4 inches) wide, ripening yellow to orange, and weighing about 500 grams (1 pound) when ripe. The pod contains 20 to 60 seeds, usually called "beans," which are embedded in a white pulp. Each seed contains a significant amount of fat. Their most noted active constituent is theobromine, a compound similar to caffeine. The tree today is found growing wild in the low foothills of the Andes at elevations of around 200 to 400 meters (650 to 1300 feet) in the Amazon and Orinoco river basins. It requires a humid climate with regular rainfall and good soil. It is an understory tree, growing best with some overhead shade. The species has two subspecies and three forms. The South American subspecies T. c. spaerocarpum has a fairly smooth melon-like fruit. In contrast, the Mesoamerican T. c. cacao subspecies has ridged, elongated fruits. There are two prominent competing hypotheses about the origins of the original wild Theobroma cacao tree. One is that wild examples were originally distributed from southeastern Mexico to the Amazon basin, with domestication taking place both in the Lacandon area of Mexico and in lowland South America. But recent studies of Theobroma cacao genetics seem to show that the plant originated in the Amazon and was distributed by humans throughout Central America and Mesoamerica. The scientific name Theobroma means "food of the gods." The word cacao itself derives from the Nahuatl (Aztec language) word cacahuatl, learned at the time of the conquest, when it was first encountered by the Spanish. Similar words for the plant and its by-products are attested in a number of other indigenous Mesoamerican languages. It is widely cultivated today, particularly in Brazil in Latin America and in Ghana, Nigeria, and the Ivory Coast in Western Africa. The main products form the seeds are chocolate, cocoa, and cocoa butter. Chocolate is made from the fermented, roasted, and toasted beans, with the fermentation used to eliminate the normal bitter, astringent quality of the seeds. 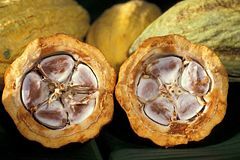 It has a combination of the solids and the fat from the cocoa beans, whereas cocoa is the solids of the cacao bean, and cocoa butter is the fat component. Cultivation and use of cacao were extensive and early in Mesoamerica. Mayan mythology held that cacao (kakaw) was discovered by the gods in a mountain that also contained other desirable foods to be used by the Maya. According to this mythology, the Plumed Serpent gave cacao to the Maya after humans were created from maize by divine grandmother goddess Xmucane (Coe and Coe 1996). The Maya celebrated an annual festival in April to honor their cacao god, Ek Chuah, an event that included the sacrifice of a dog with cacao colored markings, additional animal sacrifices, offerings of cacao, feathers and incense, and an exchange of gifts. In a similar Aztec mythology, the Mexica (Aztec) god Quetzalcoatl discovered cacao (cacahuatl or "bitter water"), in a mountain filled with other plant foods (Coe and Coe 1996). Cacao was offered regularly to a pantheon of Mexica deities and the Madrid Codex depicts priests lancing their ear lobes (autosacrifice) and covering the cacao with blood as a suitable sacrifice to the gods. The cacao beverage as ritual were used only by men, as it was believed to be toxic for women and children. Cacao is described in ancient texts, for ceremonial, medicinal, and culinary uses. The first Europeans to encounter cacao were Christopher Columbus and his crew in 1502, when they captured a canoe at Guanaja that contained a quantity of mysterious-looking “almonds.” The first real European knowledge about chocolate came in the form of a beverage which was first introduced to the Spanish at their meeting with Montezuma in the Aztec capital of Tenochtitlan in 1519. Cortez and others noted the vast quantities of this beverage that the Aztec emperor consumed, and how it was carefully whipped by his attendants beforehand. Examples of cacao beans along with other agricultural products were brought back to Spain at that time. However, it seems that the beverage made from cacao was introduced to the Spanish court in 1544 by Kekchi Maya nobles brought from the New World to Spain by Dominican friars to meet Prince Philip (Coe and Coe 1996). Within a century, the culinary and medical uses of chocolate had spread to France, England, and elsewhere in Western Europe. Demand for this beverage led the French to establish cacao plantations in the Caribbean, while Spain subsequently developed their cacao plantations in their Philippine colony (Coe and Coe 1996). The Nahuatl-derived Spanish word cacao entered scientific nomenclature in 1753 after the Swedish naturalist Linnaeus published his taxonomic binomial system and coined the genus and species Theobroma ("food of the gods") cacao. Traditional pre-Hispanic beverages made with cacao are still consumed in Mexico. These include the Oaxacan beverage known as tejate. Cacao beans constituted both a ritual beverage and a major currency system in pre-Columbian Mesoamerican civilizations. At one point, the Aztec empire received a yearly tribute of 980 loads (xiquipil in nahuatl) of cacao, in addition to other goods. Each load represented exactly 8,000 beans (Bergmann 1969). The buying power of quality beans was such that 80 to 100 beans could buy a new cloth mantle. The use of cacao beans as currency is also known to have spawned counterfeiters during the Aztec empire (Coe 1994). In some areas, such as Yucatán, cacao beans were still used in place of small coins as late as the 1840s. A tree begins to bear when it is four or five years old. In one year, when mature, it may have 6,000 flowers, but only about 20 pods. About 300-600 seeds (10 pods) are required to produce around 1 kilograms (2.2 pounds) of cocoa paste. There are three main cultivar groups of cacao beans used to make cocoa and chocolate (Xocoatl 2002). The most prized, rare, and expensive is the Criollo Group, the cocoa bean used by the Maya. Only 10 percent of chocolate is made from Criollo, which is less bitter and more aromatic than any other bean. The cacao bean in 80 percent of chocolate is made using beans of the Forastero Group. Forastero trees are significantly hardier than Criollo trees, resulting in cheaper cacao beans. Trinitario, a hybrid of Criollo and Forastero, is used in about 10 percent of chocolate. Cocoa production increased from 1.5 million tons in 1983-1984 to 3.5 million tons in 2003-2004, an increase that due almost entirely to the expansion of the production area rather than to yield increases. Over 90 percent of the world’s cacao is grown by smallholder farmers, who overwhelmingly make little or no use of fertilizers and agro-chemicals (Eskes and Efron 2006.). Bergmann, J. 1969. The distribution of cacao cultivation in pre-Columbian America. Annals of the Association of American Geographers 59: 85–96. Retrieved September 2, 2008. Eskes, A. B., and Y. Efron. (Eds.). 2006. Global approaches to cocoa germplasm utilization and conservation: Final report of the CFC/ICCO/IPGRI project on "Cocoa Germplasm Utilization and Conservation: a Global Approach" (1998-2004). Bioversity International. Retrieved September 2, 2008. Coe, S. D. 1994. America's First Cuisines. Austin: University of Texas Press. ISBN 0292711557. Coe, S. D., and M. D. Coe. 1996. The True History of Chocolate. London: Thames & Hudson. ISBN 0500016933. Dienhart, J. M. 1997. The Mayan languages: A comparative vocabulary. Cacao. Odense University. Retrieved September 2, 2008. Food and Agriculture Organization (FAO) of the United Nations. 2005. Cocao beans. FAOSTAT. Retrieved September 2, 2008. Frison, A., M. Diekman, and D. Nowell. 2000. Cacao. FAO/IPGRI Technical Guidelines for the Safe Movement of Germplasm No. 20. ACRI - FAO - IPGRI. Retrieved September 2, 2008. McNeil, C. 2006. Chocolate in Mesoamerica: A Cultural History of Cacao. Gainesville: University of Florida Press. ISBN 0813029538. Motamayor, J. C., A. M. Risterucci1, P. A. Lopez, et al. 2002. [http://www.nature.com/hdy/journal/v89/n5/abs/6800156a.html Cacao domestication I: The origin of the cacao cultivated by the Mayas. Heredity 89: 380–386. Retrieved September 2, 2008. XOCOATL. n.d. The different varieties of the species Theobroma cacao L. XOCOATL. Retrieved September 2, 2008. This page was last modified on 5 September 2008, at 18:00.